← Packer pity party…in Kona! This is my third Christmas living in Hawai‘i, and I still feel a bit discombobulated at the contrast with the holiday celebrations of the Midwest. In Hawai‘i we often see Santa depicted in board shorts holding a long board (thank God, no Speedos). 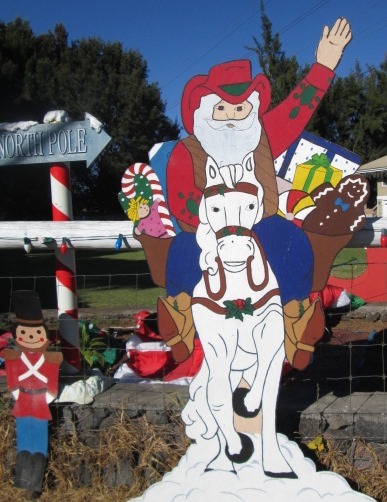 Or in paniolo (cowboy) country near Waimea, he’s riding a horse. 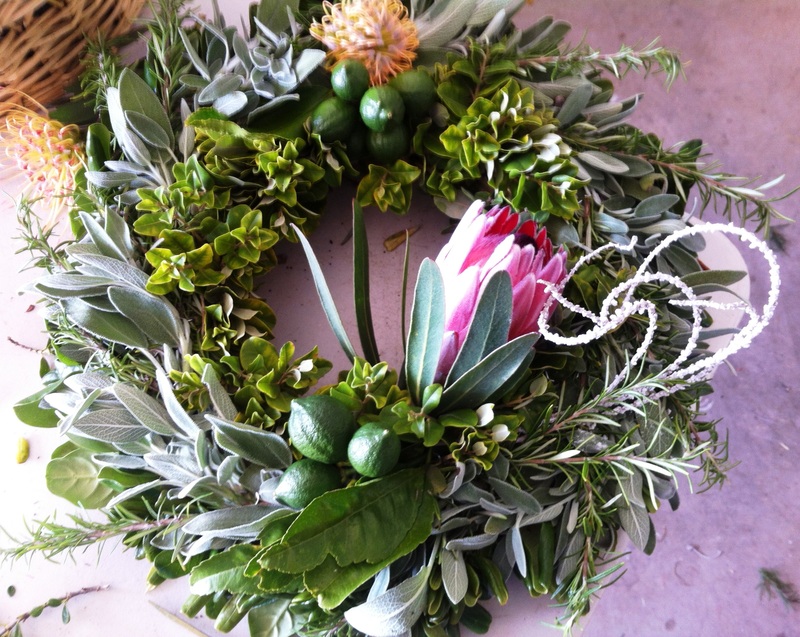 We still make wreathes for our front doors, but the local materials we use make very different creations. 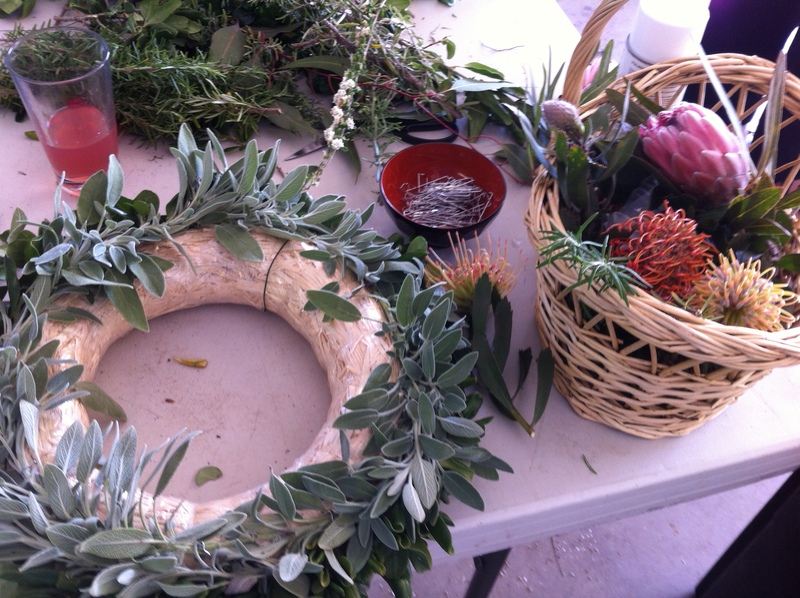 At Stacy’s wreath party I made mine mostly of sage and rosemary from my yard, and protea and small green lemons cut with permission from my neighbor’s yard. The herb fragrances hit me every time I walk in the front door. 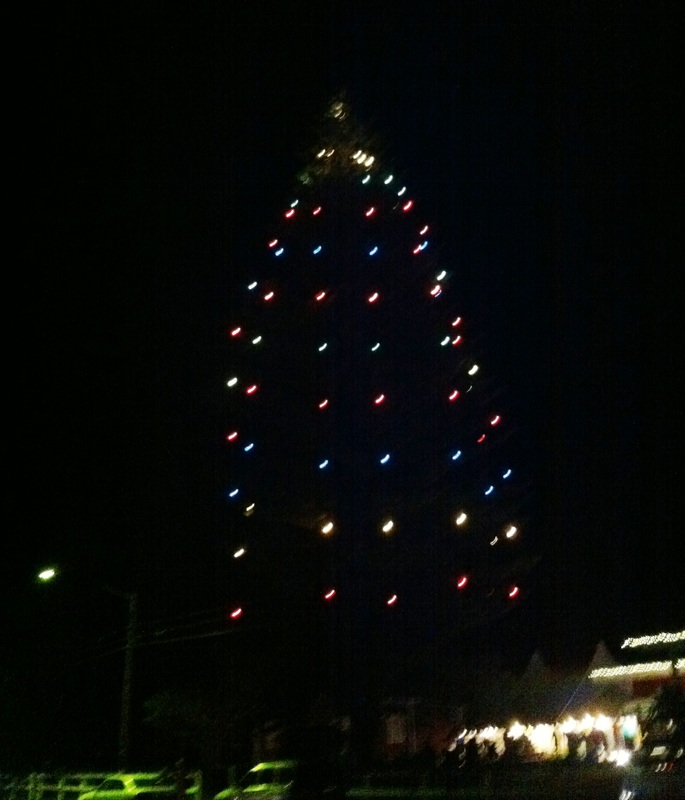 The holiday season officially opened in Waimea with the lighting of the giant Norfolk Pine on the grounds of the Parker School a couple weeks ago. The gathering included talk story with one of the old paniolo in town and a performance by young hula dancers – definitely not Midwest. It was warm that night, and kids ran around in shorts and Santa hats. When we arrived, the old kapuna was on stage under the big tent, telling stories of cattle and cowboy camaraderie from his younger years. I truly admire the Hawaiian tradition of honoring the elderly, a trait shared with most groups who’ve lived here for generations. This gent wore the tough life he had led in his now frail body. Even so, he told us of his gratitude for the lady who drives him to church on Sundays and the simple pleasures of his life. He joked that even though it wasn’t Saturday, he had taken a bath for this engagement – totally endearing. When he finished, two men carried him down the steep step from the stage. What I wouldn’t do to visit with one of my own departed family kapunas, even for a day. We all sang Christmas Carols too. 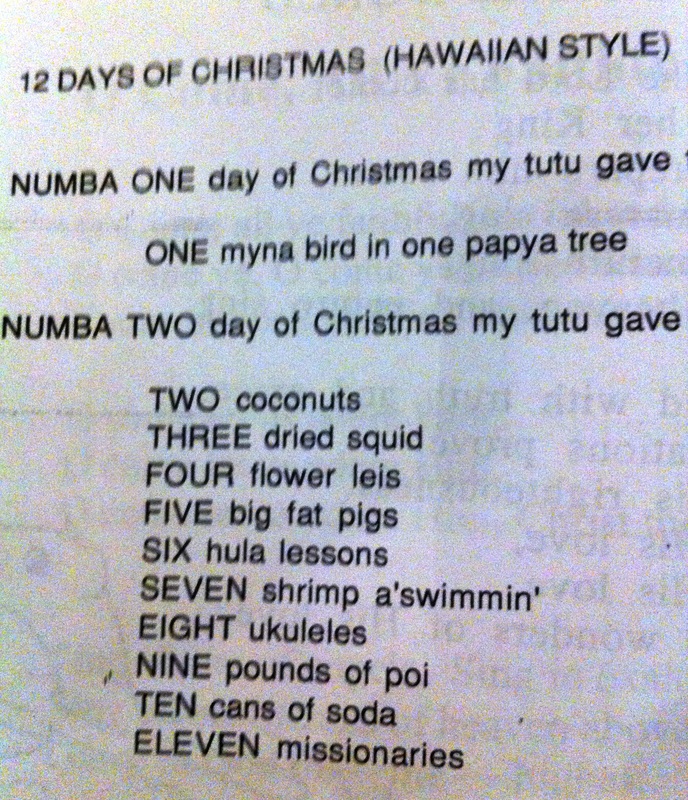 My favorite was the Hawaiian version of a “Partridge in a Pear Tree.” The 12th day was TVs – they could’ve picked something betta’. Finally it was time to light the tree. This is the biggest Norfolk I’ve ever seen. The short light to the left is the street light next to it! According to the Emcee, there are a total of 70 lights. It wasn’t exactly what I expected for a community tree, but I enjoyed it just the same as we gathered around singing “Silent Night.” Now that we do have here in Hawai‘i. But if we want to play in snow, we have to drive to the top of our tallest volcanoes. Yes, it’s different here. Time to make some new traditions. 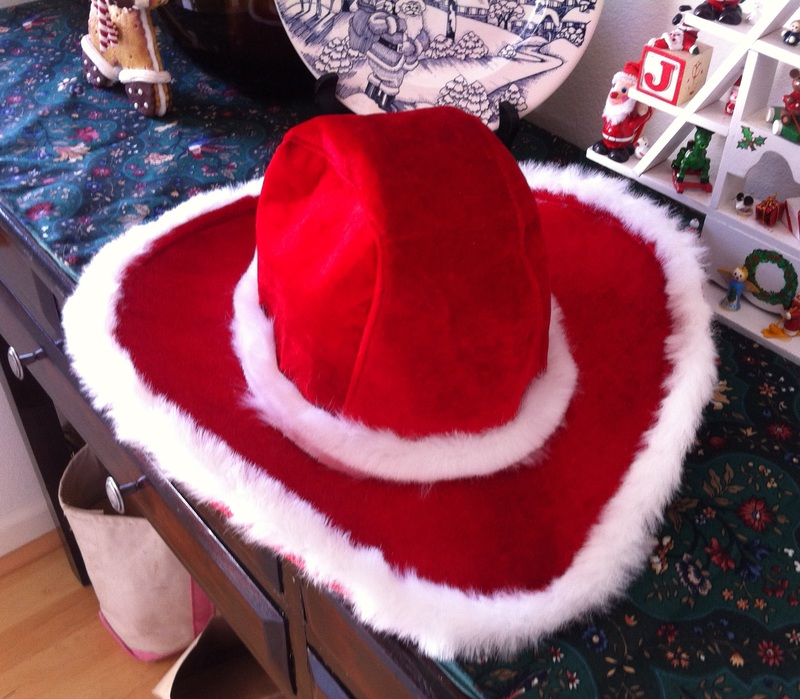 This entry was posted in Hawaii cowboy country, Holidays and festivals, Honoring tradition, hula, island culture, volcano, Waimea and tagged making new traditions. Bookmark the permalink. This essay so reminds me of my first trip to Hawai’i. Did you put up the your Charlie Brown tree?